Have you ever been in fog so thick you couldn’t even see your own feet? This was the predicament residents of London’s Isle of Dogs found themselves in in December 1952 when a dense, thick, toxic blanket of smog engulfed the UK capital for five days in what was probably the worst air pollution event in European history. The smog, variously known as the ‘Killer Fog’ and ‘The Great Smog of London’, might have paved the way for major environmental reforms, including the Clean Air Acts of 1956 and 1968, but the destruction it caused was significant: it claimed the lives of as many as 12,000 Londoners, killed animals, caused breathing problems in many and disrupted travel. And for years researchers, despite knowing that many of the deaths were probably caused by emissions from coal burning, the exact chemical processes that led to the deadly mix of fog and pollution have not been fully understood. Until now. A research project involving universities from China, the US and the UK claims to have solved the mystery of the Killer Fog. Their research is published in the current issue of Proceedings of the National Academy of Sciences (PNAS). 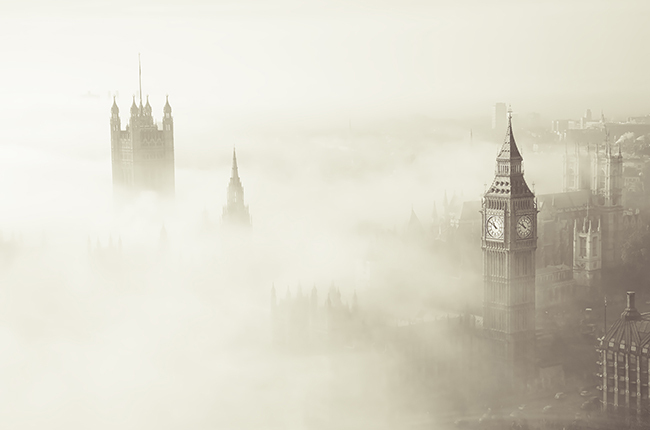 On 5 December 1952 London was enveloped by fog. Nothing particularly unusual there. Londoners were well used to having thick mists dropped on them. But this one was of a different scale. It got worse, bedded in. The sky went black. Visibility in many parts of London was drastically reduced – to three feet in some places. The transport network was grounded. Thousands of people – tens of thousands of people – found it difficult to breathe. By the time the fog lifted, on 9th December, at least 4,000 people had died and more than 150,000 had been hospitalised. Thousands of animals in the area were also killed. Today, that 4,000 figure is put far higher, at 12,000. All in all, huge amounts of impurities were released into London’s atmosphere. On each day of the fog, 1,000 tonnes of smoke particles, 2,000 tonnes of carbon dioxide, 140 tonnes of hydrochloric acid and 14 tonnes of fluorine compounds were released. So what have the researchers found out? To find out what turned the fog into a poisonous one, the scientists recreated the fog in a lab using results from experiments from Beijing and Xi’an, two of China’s most-polluted cities. “People have known that sulfate was a big contributor to the fog, and sulfuric acid particles were formed from sulfur dioxide released by coal burning for residential use and power plants, and other means,” Renyi Zhang, the lead author of the study and an atmospheric scientist at Texas A&M University, said. “But how sulfur dioxide was turned into sulfuric acid was unclear. Our results showed that this process was facilitated by nitrogen dioxide, another co-product of coal burning, and occurred initially on natural fog. As well as solving a mystery of the past, the study has the potential to solve a problem of the present: air pollution in China. There, a similar chemical process occurs often, driven by its massive industrial growth and urbanisation over the past few decades. While China has worked hard to reduce its air pollution problem, citizens are still often required to wear breathing masks through the day. “A better understanding of the air chemistry holds the key for development of effective regulatory actions in China,” Zhang said. “The government has pledged to do all it can to reduce emissions going forward, but it will take time.